A great new set of products that we have just brought in at Wedge Worldwide are a variety of super yummy chocolate bars from Theo Chocolates. 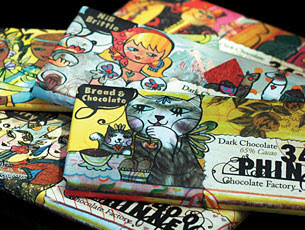 Theo produces premium, organic, Fair Trade and specialty chocolate. Their founder, Joseph Whinney, pioneered the manufacture and supply of organic chocolate products as the first importer of organic cocoa beans into North America in 1994. 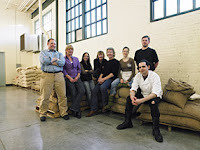 Over a decade later, Theo is proud to be the only roaster of organic cocoa beans and the first roaster of Fair Trade certified cocoa beans in the United States. All of their ingredients are carefully selected to ensure they meet their standards for social and environmental responsibility. There's a photo of some of the swell folks from Theo pictured in their Seattle based factory above. •Nib Brittle and Dark Chocolate Bar- Those who love cocoa nibs will really like this bar. It has a satisfying crunch to it and a pleasant dark, mildly bitter taste. The 65% cacao content packs an enjoyable, but not over powering, punch. It makes my heart beat a little faster with dark chocolate joy. •Chai Tea Chocolate Bar- Normally I'm much more of a dark chocolate fan, but the milk chocolate Phinney bars really won me over! This unusual and delightful milk chocolate bar is highly enjoyable. Who knew that chai tea and chocolate went so well together? I love the strong hints of cinnamon and milder notes of ginger. •Bread and Chocolate Bar- This bar is a true work of art! A creative pairing of dark chocolate, buttery bread crumbs and a pinch of sea salt. I was skeptical at first but was pleasantly surprised. It's delicious! Many of my co-workers were a fan of this flavor. •Coconut Curry and Milk Chocolate Bar- It's hard to choose but I think that this flavor is my absolute favorite. I thought it might be kind of funny to put chocolate and curry together but the magical people at Theo have married a perfect blend of delectable tastes in this bar. The spicy curry provides a lovely, gentle background for the delicious toasted coconut that can sometimes be found throughout the bar in tiny little chewy slivers. Yum, yum, yum. •Vanilla and Milk Chocolate Bar- A friendly, smooth, melt-in-your-mouth bar with satisfying over tones of real Madagascar organic vanilla beans. I'm already planning on including Theo chocolate bars in my own holiday gift packages that I'll be sending out through Wedge Worldwide this season. Your friends and relatives are sure to enjoy these chocolates but don't forget to treat yourself too!